One of the best family Pacific Island holidays you can take is to the beautiful island of Samoa. Think isolated tropical paradise, palm trees, stunning beaches, gorgeous waterfalls and lush vegetation – Samoa is the perfect place to kick back and relax. In this guest post Mel Kayes (my sister!) 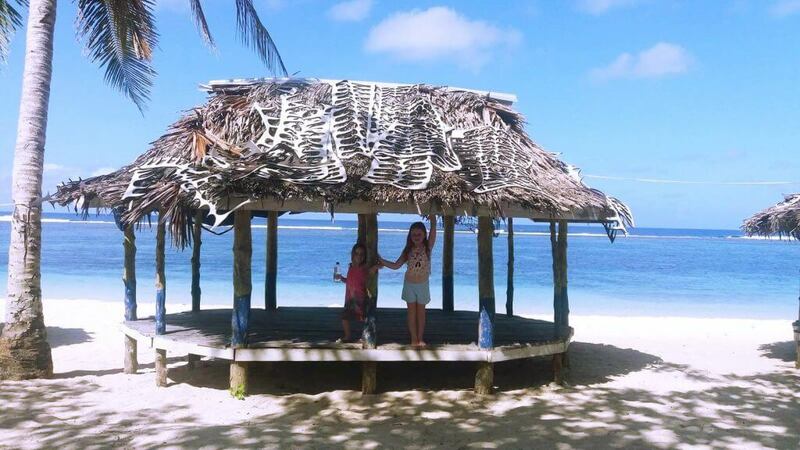 has put together the Ultimate Samoa Family Holiday guide based on a recent trip with her 5 and 7 year old daughters. Here’s the low-down on travelling to Samoa with kids, including information on one of the best Samoa family resorts out there – Saletoga Sands. 2.9 Kick back and relax! Being the sister of “Our Overseas Adventures”, you might expect me to have an adventurous nature too. The reality is that my family is far less travelled! We tend to go overseas every few years and so far have just been to destinations close to home while the kids are young. Thankfully we are extremely fortunate to have a version of paradise just on the doorstep of New Zealand, enabling us to escape the depths of winter and experience a different culture and scenery with minimal travel time. Samoa is located in the Pacific Ocean halfway between Hawai’i and New Zealand. It’s around 4 hours flight from New Zealand or 5 hours from Sydney, Australia. Samoa is made up of two main islands – Sa’vai and Upolu, with Apia, the capital city of Samoa located on Upolu. 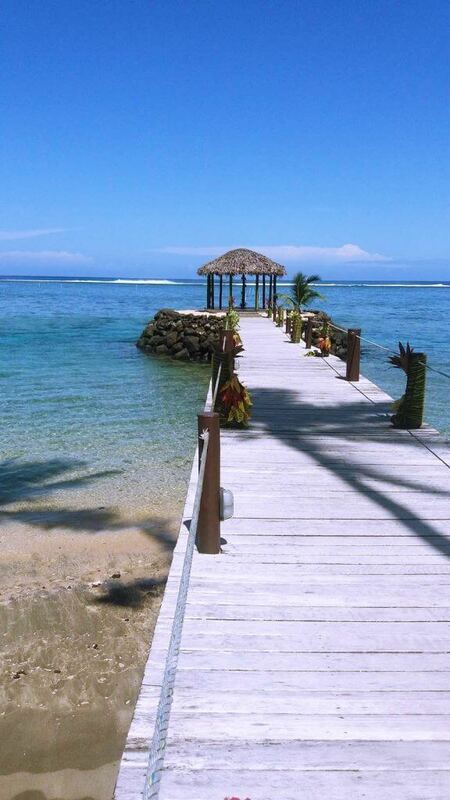 The weather in Samoa is tropical, with a delightful average temperature of 26 degrees. 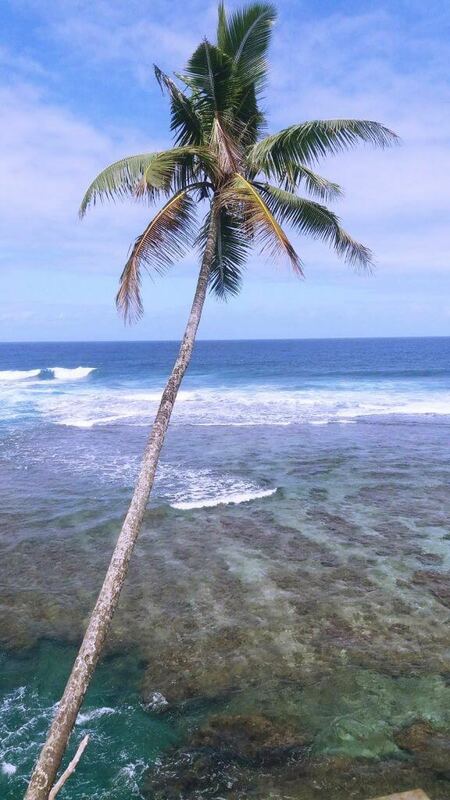 For this holiday, we stayed on the beautiful island of Upolu. One of the best ways to get around is to hire a car for a couple of days like we did. This allows you the freedom to explore as you go and check out some of the main site and get a real sense of Samoan culture. 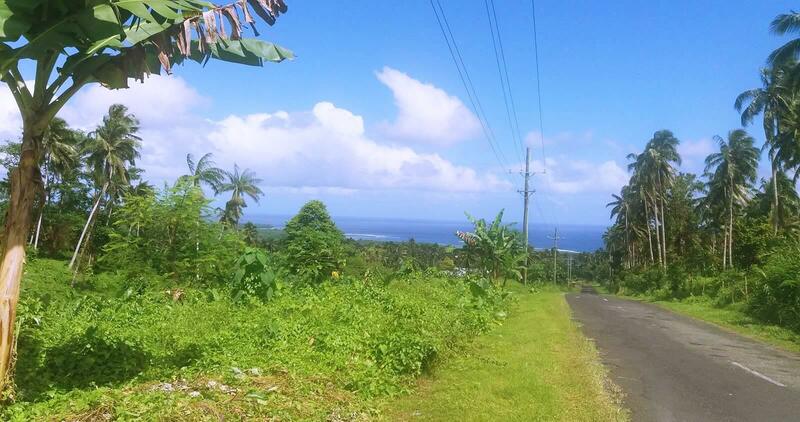 Driving around Upolu is an adventure in itself, the Cross Island Road over the mountains to the city of Apia provides spectacular views, the north east coast roads equally scenic with a lake and misty mountainous backdrops. Everywhere you go there are churches, quaint villages with extremely basic housing, roadside animals galore, beautiful plantings and friendly people who wave as you drive past. It’s a big island- 1125 square kilometres – and while the main roads are sealed, they’re pretty narrow and rough and you need to take it slow. So it takes a while to get places. Lalomanu beach is a famously beautiful stretch of white sand and crystal clear blue water on which there are fales built on the sand. Our girls loved exploring this stunning beach and it was a great daytrip. There are day fales for hire or you can stay overnight. 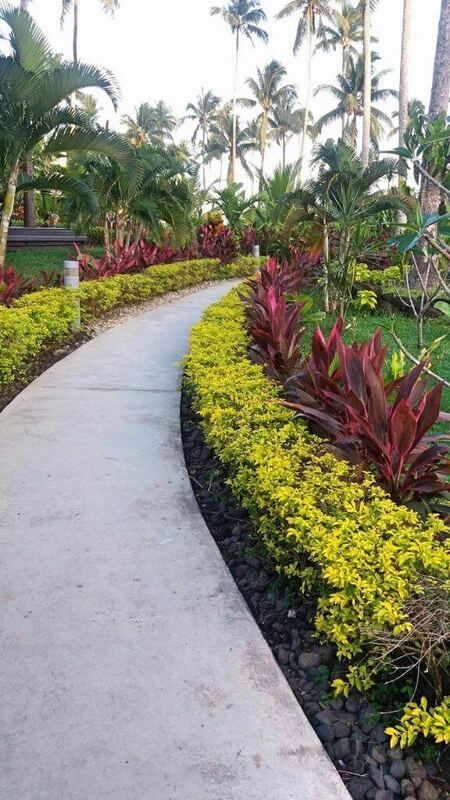 Around 5km from the capital city Apia is 30 acres of beautiful gardens that make up the Vailima Botanical Gardens. 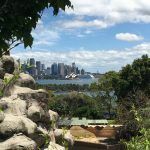 The gardens are a mix of native and introduced species and typical of many plants and flowers found in the South Pacific region. While there you can visit the Robert Louis Stevenson Museum. The Scottish author – famous for writing ‘Treasure Island’ and ‘Dr Jekyll and Mr Hyde’ lived his final years in Samoa, and his home Vailima has been converted into a museum. 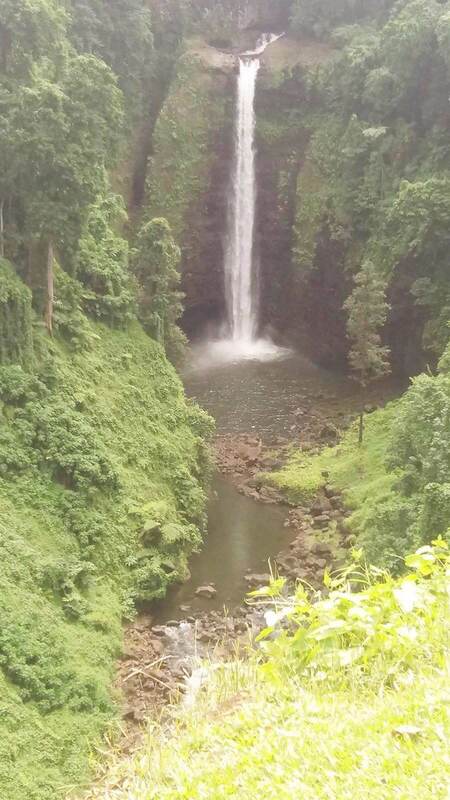 The Sopoaga Waterfall in Lotofaga village is a beautiful waterfall surrounded by lush vegetation of native Samoan plants and trees. 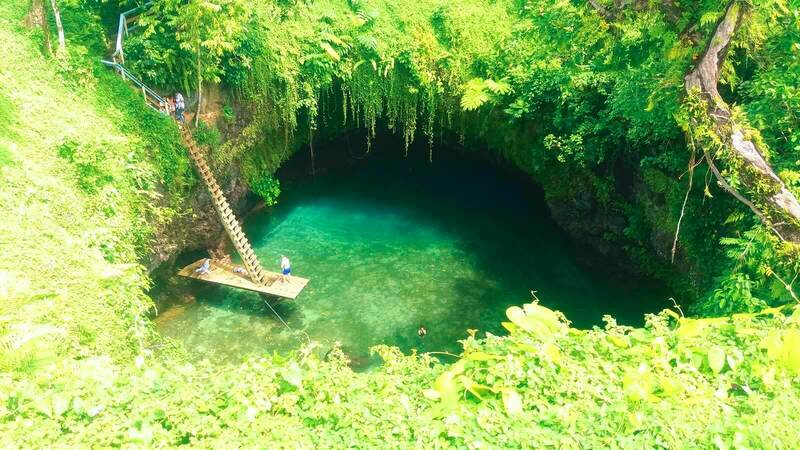 The To Sua Ocean trench is an incredible swimming hole that’s on the Main South Coast Road. 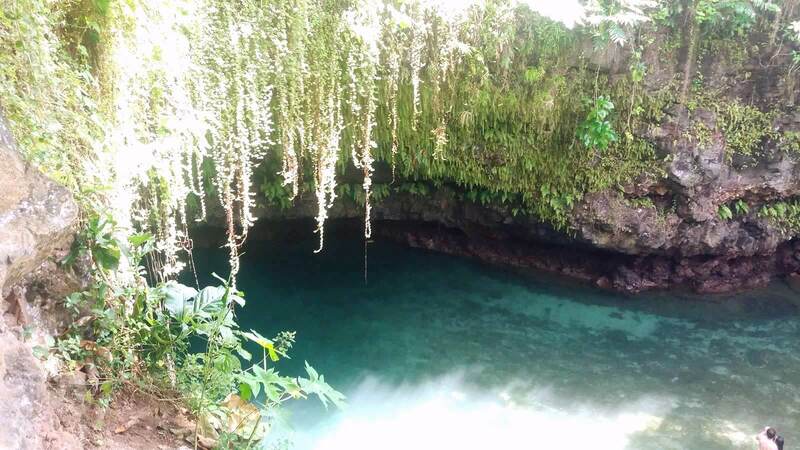 ‘To Sua’ means giant hole, and this epic spot is actually two giant holes joined by a lava tube cave. 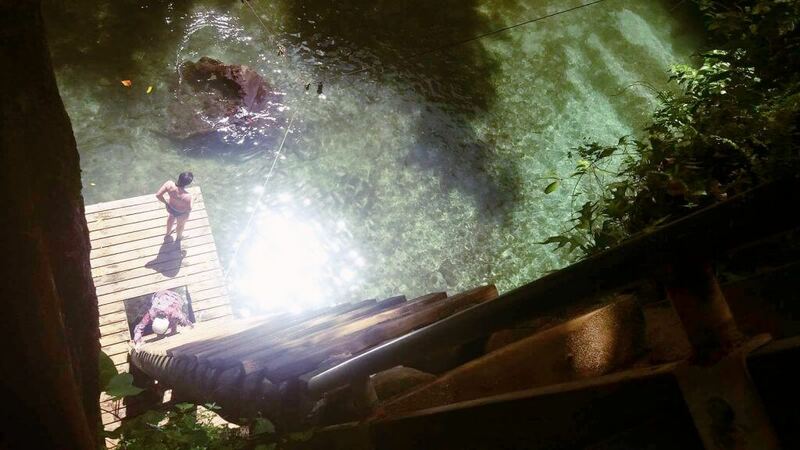 The main swimming hole is 30 metres deep and getting there is down a very steep ladder – not for the faint-hearted. We chose to admire from a distance as it was a bit too steep for the kids. It’s open year round from 7am to 6pm and 12pm to 6pm on Sundays. Many of the resorts on Upolu are sheltered by reefs, which makes for excellent snorkelling and kayaking, particularly for kids. Some of the best snorkelling spots are at Lalomanu Beach, the coves around Matereva, along the Aleipata coast and the Palolo Deep Marine Reserve in Apia. Samoa is a deeply Christian country, and the islands are dotted with churches wherever you go. If you are there on a Sunday morning it’s highly recommended to attend a church service to hear the beautiful singing and immerse yourself in an important part of Samoan culture. 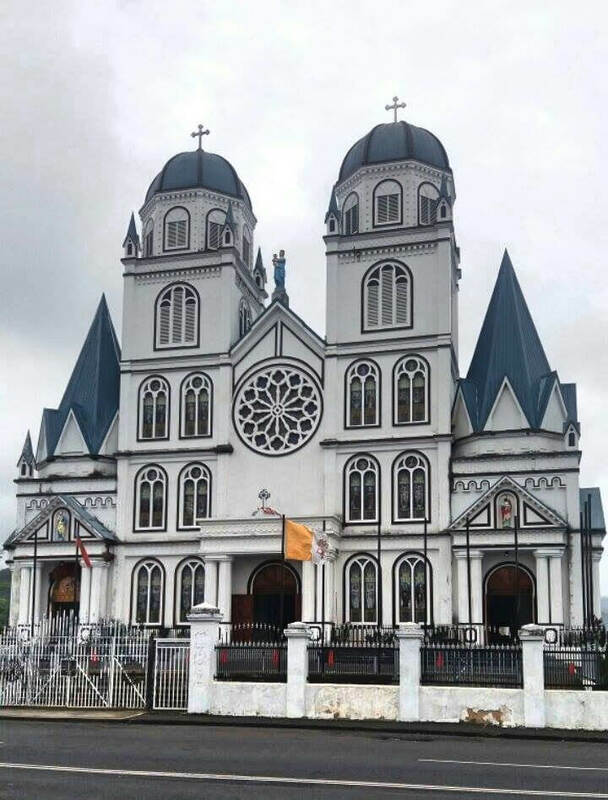 The catholic cathedral in Apia is a simply stunning building and a must-see in Samoa. The capital city of Samoa is Apia is much of what you’d expect of a small Pacific Island city. It’s busy, with traffic lights, traffic wardens, multiple lane roads and a black sand harbour with concrete barricades – a stark contrast to the quaint prettiness that the rest of the island offers! Apart from the cathedral, the Apia market is worth a visit, with lots of stalls selling quality clothing and artefacts. Unfortunately the main market was damaged by fire recently and is yet to be rebuilt, so the temporary market is somewhat smaller. All stores are closed on Sunday. Older kids and adults will enjoy the Papase’ea Sliding Rocks which are a natural waterslide! Located in Faleata (around 15 minutes from Apia), the rocks have been worn down by thousands of years of running water, making a smooth sliding surface. There’s a five metre slide for adults and three smaller slides suitable for kids. Toilets and change rooms are available on site. You don’t come to Samoa for luxury restaurants and pumping nightlife! Relaxation is the name of the game here and it’s the perfect place to re-connect with your kids. We spent many hours in the pool and ocean playing and enjoying time out from the daily routine. There’s a number of hotels and resorts in Samoa for every budget, from luxury family holidays to simple beach fales. When we travel we like to go fancy, so we chose to stay at the Saletoga Sands Resort and Spa, which is about one hours drive from Faleolo International Airport on the south coast. First impressions upon waking on our first morning at Saletoga Sands were pretty wow! The resort is just a few years old and is built on the site of an old coconut plantation, so there are coconut trees galore as well as beautiful lush gardens. Saletoga Sands Resort & Spa has been well designed, with beachfront villas and family oceanview villas situated around the pool. Each villa also has a gorgeous private outdoor shower. the pool has a swim up bar, kids club on demand, Island night, everything you would need in a family resort. The staff are extremely friendly and very happy to cater to your every need. There’s even a quaint jetty which provides an opportunity for private dining. The food at Saletoga Sands is great, with the main restaurant offering plenty of variety (around 15 different mains to choose from). There were plenty of good options for kids and different dietary requirements were catered for. A daily continental breakfast is included with your stay and the choice is huge, from fruits, cereals and toasts to muffins, danishes, all sorts of savoury treats which you could also take away with you for morning tea or perhaps even a light lunch. Most days we stayed at the resort we ordered lunch at the pool bar and it was delivered to our deckchairs with a smile – awesome service! We absolutely loved our stay at Saletoga Sands Spa and Resort and wouldn’t hesitate to recommend it to other family travellers. Check prices for Saletoga Sands Spa and Resort and book now! 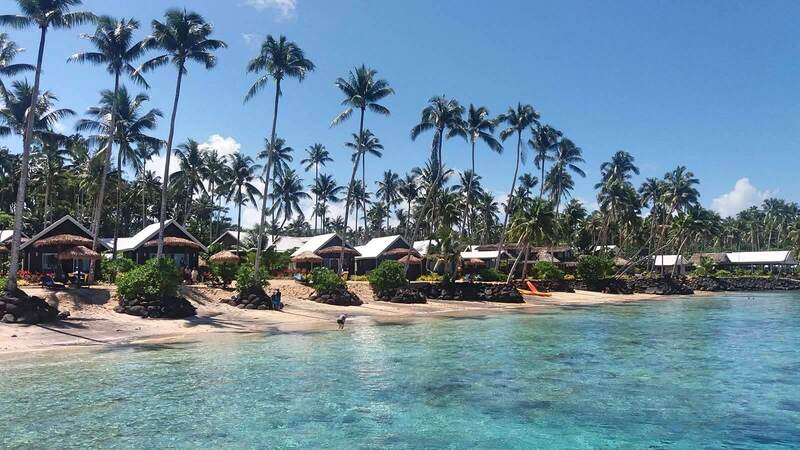 Located directly on the beach in Maninoa, Coconuts Beach Resort and Spa is another great choice. There’s even a two-storey treehouse that you can stay in! We had lunch here one day and the food was fabulous. Check out prices and book Coconuts Beach Resort and Spa here. Aggie’s Resort Samoa is one of the best longstanding hotels, and it’s recently undergone a multi-million dollar refurbishment. Family rooms are available and kids will love splashing around in the great pool. Check out prices and book Sheraton Samoa Aggie Grey’s Hotel & Bungalows here. 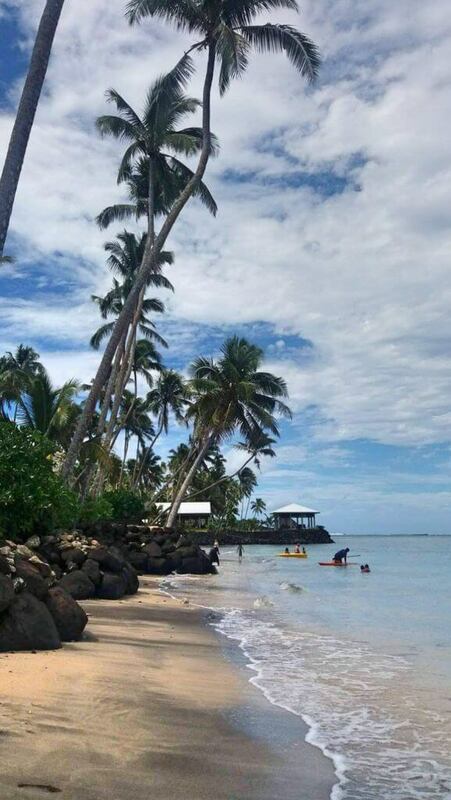 If getting back to nature and staying in a traditional fale style accommodation is more your thing, then Litia Sini Beach Fales at Lalomanu Beach is the perfect place to stay. Located right on the beach, it’s a fabulous location to chill out and relax, and there’s family beachfront fales available to book starting from US$175 per night. Check out prices and book Litia Sini Fales here. Set on a white sand beach at Salamumu Beach, these beachfront fales are the perfect family getaway. The bungalows are self-contained if you want to do some of your own cooking, otherwise the on-site restaurant specialises in freshly caught fish. The fales even have an outdoor lava rock shower! Check out prices and book Sa’Moana Beach Bungalows here. 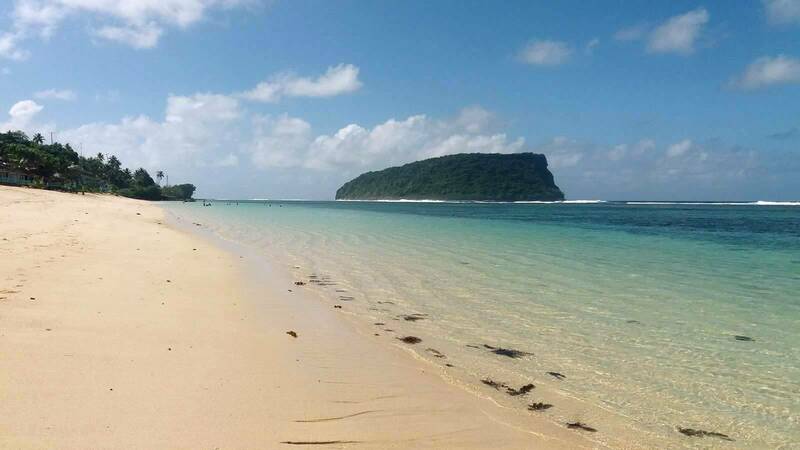 Sava’ii is the largest island in Samoa and another great option for a family holiday if you’re truly looking to get away from it all. Sava’ii is less developed than Upolu, and is a 90 minute ferry ride from Mulifanua Wharf in Western Upolu. If you’re wanting to do some independent exploring of Upolu, you’re best to hire a car which can be done before arrival or at the airport. If you don’t want to hire a car, most resorts and hotels in Samoa can organise an airport transfer and day tours for you. To travel local style, there are also buses that take you around the island but they don’t run to any timetable or bus stop, you just wait for one to come along and let the driver know when you want to get off. The buses are very colourful, named and pimped with accessories! We were told the locals often sit on each others laps when the bus is full and will invite tourists to do so also 🙂 Driving around in our rental car we tended to see buses only very occasionally and often several following each other. So while quirky and fun, it didn’t seem like the most reliable form of transport! Because Upolu is so big, eating options are spread far and wide, so you may find yourself eating at your resort a lot of the time. 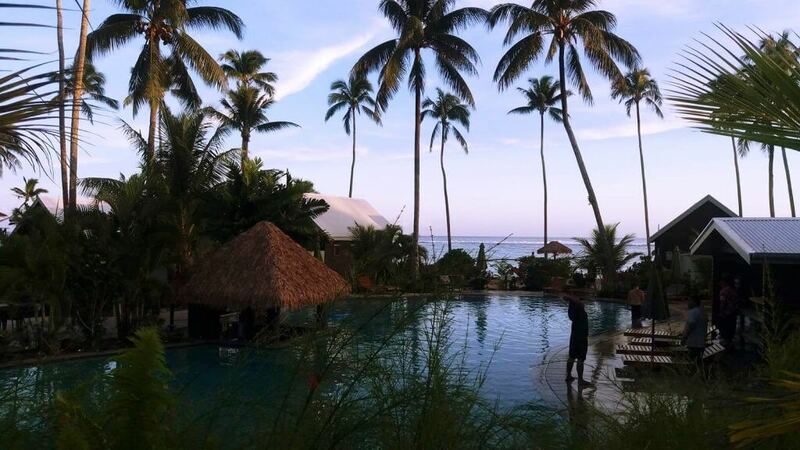 If you are out and about, we’d highly recommend a lunch or dinner at Coconuts Beach Resort. It’s renowned for its food and we had a beautiful lunch in their amazing outdoor area. A highlight was their delicious pina colada cocktails served in an actual coconut! In Apia there are some nice restaurants and cafes. Our pick was Milani Cafe which had great air-conditioning, and lovely selection of cakes and savouries. The highlight was an amazing iced moccachino made with coconut milk – divine! If you’re staying in self-catering accommodation, there are two supermarkets in Apia as well as a fish market and fresh produce market. There’s also a number of superette style food retailers and dairies dotted around the island. They sell a lot of Australian and New Zealand branded foods and the snacks are not too badly priced, a packet of potato chips was around US 70c more than what you would pay at home. Try the local packaged taro chips if you find them, very similar to corn chips and cheap! If you’re keen to save money though you can bring almost any packaged food item into Samoa without hassle, we took lots of snack foods with us and declared them, the bags were scanned in the agriculture section and we were on our way. The supermarkets and some local shops stock nappies, formula etc, this was also available at our resort but at a premium as you’d expect. Samoa’s a great year round destination, but peak season is when the weather in Samoa is at its driest – the Southern Hemisphere winter months of May to October. It’s still fine to visit during the summer rainy season but expect hot, humid temperatures and bring a raincoat! Samoa is four hours flying time from Auckland, and Air New Zealand often have cheap flights to Samoa if you keep an eye out. Some of the larger travel chains such as Flight Centre and House of Travel regularly do families and couples holidays to Samoa packages. You can also fly direct to Apia from Sydney, Australia with Virgin Blue. We spent 10 nights here and it was the perfect length of time to both relax and explore a large part of the island. We’re keen to come back some day and visit the parts we missed and also take a trip to the “big island” Savai’i! We’d highly recommend Samoa for anyone wanting a relaxing holiday with a bit of culture and natural, beautiful sightseeing. Looking for more Pacific Island holidays inspiration? Check out our Fiji family holidays guide. 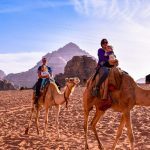 **Note: Our Overseas Adventures is a participant in the Booking.com affiliate programme, an affiliate advertising program designed to provide a means for sites to earn advertising fees by advertising and linking to Booking.com.